Last year Mary P sent me an email sharing a picture of her version of my free peacock applique block (here). She said that it was going to be the center block for a round robin that she and her friends were running. Well it's now a year later and her top is finished and has been returned to her. Wow, am I impressed with the talent of her friends. Christine G added the little scallop border to the peacock block. Then Becky R (with a little help from Andra R) added the lovely applique vine border. The french braid was from Mary E. While Mary R (boy, they had a lot of Marys on their team!) created the white and blue border. Finally the last border of 10-minute blocks sewn with peacock fabric was thanks to Debbe S. The ladies did a fantastic job of bringing the peacock block to life. Thank you so much Mary P for sharing this with us! You and your friends have created a beautiful quilt that you'll treasure for a long time. I'm so happy to see how many people have used the peacock applique. And remember, if you use it I would love to see what you've created. And if you're looking for the peacock pattern, it can be found here. I normally make doll dresses, and why I took a notion to spread my wings into quilting I will never know LOL Well I guess I really do, I was all excited about getting a new Janome sewing machine this spring after losing mine in a tornado, and while I was researching machines I saw a yahoo group for Janome owners and joined. There are many quilters in the group and the beautiful projects they were working on got me interested in tackling one. I've been sewing since I was 14 (Home Ec in 1959) but only clothing and curtains. My first ever quilt this spring was a pastel floral for my room, then decided to make something new for the guest room which my plans were to do in blue and yellow to match some oil paintings I did back in the 80s. I had bought the purple/blue geometric print just because it was so striking, then looked at it a couple of weeks thinking how pretty it would be to put in a quilt. I found an inspiration quilt on flickr that looked like it would be beautiful in jeweltones, then rummaged around in my 'stash' of fabrics bought for doll dresses, and found 5 that seemed to harmonize with the geometric. One thing called for another - the purchased dust ruffle didn't look right (different fabric, different color of white) so I split it and added the band of quilt fabrics. Then made the valance to match the dust ruffle. Copied some of the bedspread design into the pillows. The wall hanging was an afterthought - I couldn't find any kind of framed print with the right colors and after seeing how gorgeous your peacock turned out, it inspired me to try my own very first wall hanging. Now I'm hooked - I have a million ideas I want to try. :o)) One of my friends is wanting me to make a quilt with a big peacock as the center. Thank you for sharing! I think that Alma deserves a big round of applause for making such a gorgeous guest room. Wouldn't you just feel welcomed to her home when you walked into this room? Thank you Alma for sharing your pictures with us. Remember the Mermaid ATDs? I thought that you'd like to make one too. Download the pattern here Download freebie_mermaid_atd.pdf . 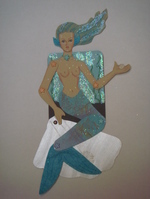 Make sure that you print it without scaling the size so that the finished mermaid will be the size of a trading card. If the 1 inch box measures accurately when printed you'll be fine. Have fun and let me know when you've made one. I'd like to see what variations you come up with. Enjoy!